Charles Lowe Service Details - East Liverpool, Ohio | Dawson Funeral Home, Inc.
WELLSVILLE – Charles A. “Charlie” Lowe, of Wellsville, passed away Monday, October 15, 2018. He was 92. Born in East Liverpool, May 17, 1926, he was a son of the late Catherine Morton Lowe and lived all his life in this area. A veteran of the U.S. Army, he worked at Ohio Power for over 40 years. 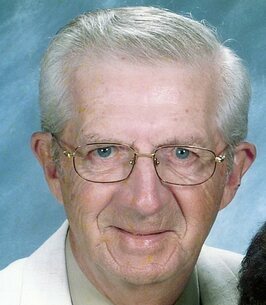 A member of the Beaver Meadows Golf Course, Charlie loved to golf and was proud of his many holes-in-one. He was a member of Holy Trinity Parish. He is survived by his wife, Myrna Fultz Lowe, at home. The couple married in 1981. A step-son survives as well, Rich Phillips and his wife, Betty Ann, of Wellsville, along with a step-grandson, Attorney Joseph Phillips of Wellsville. Charlie also is survived by many special nieces as well as a host of friends and neighbors who were always supportive and helpful. Arrangements were conducted by the Dawson Funeral Home. To send flowers to the family of Charles A. "Charlie" Lowe, please visit our Heartfelt Sympathies Store. No one is ever gone, unless they are forgotten!